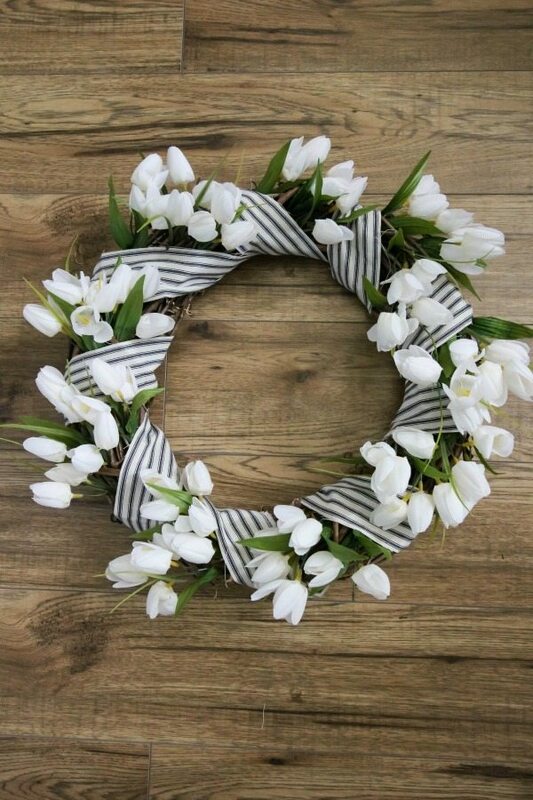 I’ve wanted to make one of these tulips wreaths for a few years now, ever since I saw my friend Jacque’s that she made using dollar store tulips. Now, her wreath is the queen of all tulips wreaths in my opinion. It’s big and fluffy and majestic. Mine is definitely the more simple version for people like me who want a quick fix and something that’s a little more “good enough”. 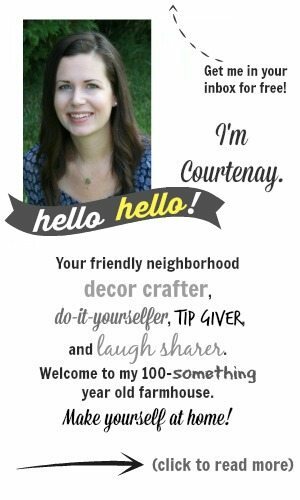 I also think mine ended up looking a bit more farmhouse-y, which is just perfect for this house. I used fewer tulips and some fabric strips to fill in the blank spaces, but I think it really works! 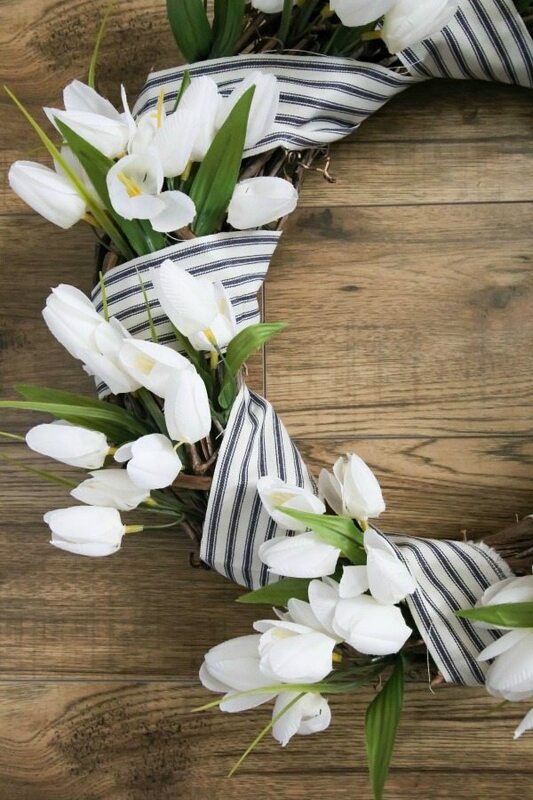 If you love these tulips wreaths too, this is a little bit of a different version for you to try out. All of the stars aligned on this project and it ended up only costing me about $10 total. The tulips were the less expensive ones from Michael’s and they were buy one, get one free. The grapevine wreath I already had, and I used the strips of fabric that I already had instead of ribbon. 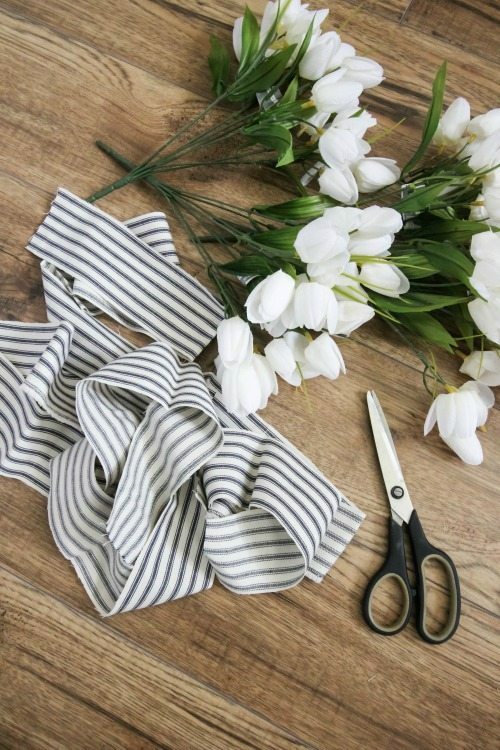 I found I was feeling most drawn to the blue and white striped ribbons at the store, so it seemed silly not to just use the fabric that I already had at home! If you had to pay full price for all of these materials, they would probably cost about $40 or so, which is still a lot less than the $80-$100 (or more!) 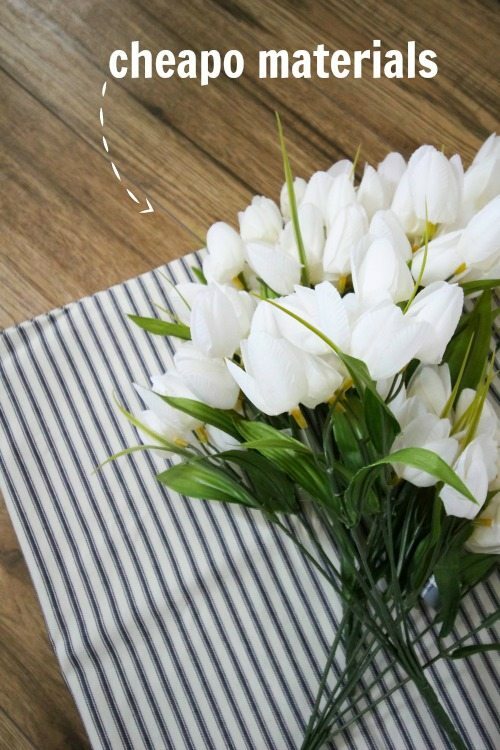 that these tulips wreaths are often sold for! I started out cutting the individual tulip stems off of the bunches of tulips so I could place one at a time in my wreath. Then I wrapped the fabric strips around the wreath, leaving a few inches of exposed grapevine after each time around. I attached the ends of the ribbons with a dab of hot glue. I tucked about 3-4 tulips into the parts where the wreath was exposed, pushing them in between the fines far enough so that they would hold and look pretty. No glue needed there! Here’s how it looked in the end! 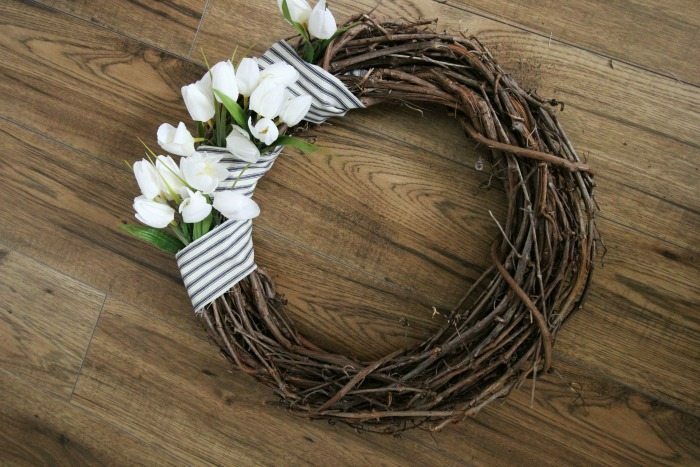 Have you ever made one of these tulips wreaths? Im a huge fan. Even painted my walls Zepher Grey. They look fabulous! I have 2 silver plate small goblets which were a gift from a dear friend that passed. They need to be re plated but I just cannot afford that. Any ideas on what to paint them with? A chalk paint? I love it! You did an awesome job. Thanks for the tutorial and photos. I want to try to make one, emphasis on try (lol). It’s really so so easy, Pam! Just wrap the ribbon and tuck the flowers! My favorite kind of project for sure! What a pretty wreath! Thanks for sharing. I LOVE those succulent wreaths! #WreathGoals! I usually just add like 2 sprigs of a seasonal flower to my grapevine wreaths outside, but I decided to up my wreath game just a tiny bit this time and I’m so glad I did! This is adorable!!!! I love the baby tulips.